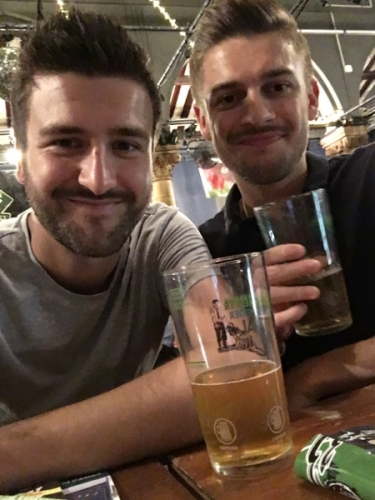 Town fans Evan and Alex Herbert are offering TWTD readers 30 per cent off their first month’s order from their new beer subscription service, Beer Me Now. “We have always been passionate about beer and have always wanted to run our own business, so in the past few months have given up our careers in retail and property to pursue this dream,” the duo told TWTD. “We have now launched our beer subscription service called Beer Me Now where customers pay a set monthly fee of £25 and receive a box containing a unique blend of different craft beers and ales (such as porters, pale ales, browns, ambers, sours, bitters, stouts and lagers) plus a snack. “The business operates solely through our website - www.beermenow.co.uk - and customers have the option of purchasing our monthly (Enthusiast), bi-monthly (Experimenter) or quarterly (Economical) subscription boxes depending on their beer drinking preference. Colchester-based Evan, 27, and Alex, 25, are lifelong Town fans. Having been season ticket holders for some years they are now Silver members and get to around 80 per cent of home games, sitting in the lower tier of the Sir Bobby Robson Stand, and about 40 per cent of away matches. To take advantage of the offer, visit their website and take out a subscription, using the promo code ‘twtd’. Beer Me Now’s social media handle is @beermenowhq, while they can be contacted by email via info@beermenow.co.uk. They need to hook up with Away Days Beers, get a bottle of Boncho or Hoppy Robson involved! How about an ITFC Promotion subscription box (Teetotal)? You never actually receive any beer. I ordered over the weekend and received my box yesterday! A great selection.. would definitely recommend! Not a bad idea given that The Sir Bobby Robson Stand ran out of beer during half-time against Norwich? - or more like it was a deliberate Club policy as they all ran out the same time which is a bit rich given that the Station Hotel (away fans' pub) was open at 6.00am on Derby Day after being granted a special license which makes something of a mockery of a noon kick-off to limit drinking. Also the ITFC FanZone opened at 9.30 but could not serve alcohol until 10.00am. Received my first subscription box yesterday and I am very pleased with it. Great variety of beers to get stuck into which came with a personalised letter from the Evan and Alex explaining each beer that was within the box I found that to be a nice touch. The snack of Worcester sauce crisps are up there with the best I've tasted. Free beer mats and a pen happy days. I couldn't recommend enough !!! I’ll be given them a try & FYI the East of England stand ran out of beer as well. Brought two guests who were delighted to abuse me accordingly. On occasion take my children to a game and for that reason go in the Sir Alf. Whether you go to Legends or one of the other vendor's, the bar is always ridiculously under staffed even at a game with a fairly low crowd. Usually a couple of young ladies working flat out and obviously under lots of pressure. Why, knowing that it was the Norwich game was not only beer but food allowed to run out while there were still queues as far as you could see? Sorry to come across as a pedantic git but whoever is in charge of catering needs a dam good talking to. I'm sure the loss in revenue must far outweigh the cost of a few extra staff for an hour or two. Look like two upstanding members of the ITFC and beer drinking community to me! Seems to be a good selection too. All the best chaps!